Aquamarine tumbled, polished and hand-picked. Most are a pale blue-green in their coloring. 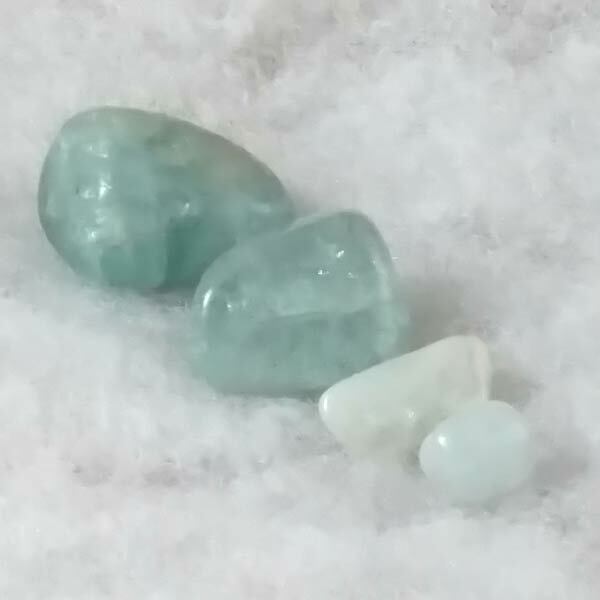 Aquamarine will encourage spiritual growth, foresight, farsightedness, clairvoyance or mediumistic qualities. Available in four sizes: Large(1.25"), Medium (1"), Small (.5") and Extra Small (.25"). Fills the hara line with healing light that reaches the kundalini line via the thymus, connects the hara and kundalini channels and chakras. Comforts in times of intense physical, emotional and karmic release and supports you in the process. Brings about core soul repair and healing, aids soul retrieval and heals deeply at all levels. solution has been enriched with berylium. 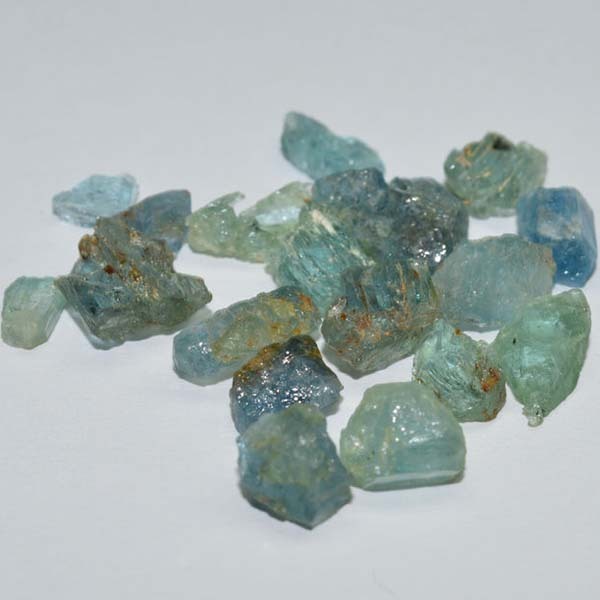 Aquamarine gets its blue-green to blue color from traces of iron. It's name comes from the Latin/Italian of aqua marina - seawater. It can be found in the U.S., Mexico, Russia, Brazil and India. Occasionally, parts of a long crystal are found to be a pale yellow color. This would have been caused from exposure to superheating from a nearby magma source (the same occurrence that can morph Amethyst into Citrine). Aquamarine can be worn constantly on the body. In the case of eye infections, it can be laid directly on the eyelids in the evening. Aquamarine will encourage spiritual growth, foresight, farsightedness, clairvoyance or mediumistic qualities. It assists in making us upright and honest, goal oriented, dynamic, persistent and successful. 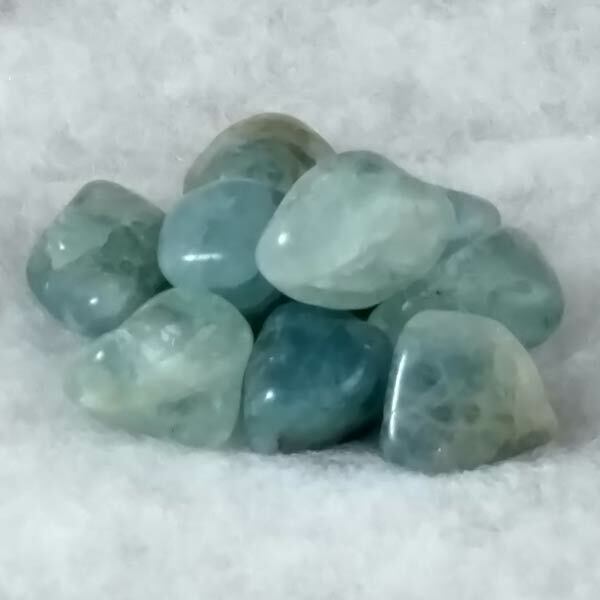 Aquamarine brings light heartedness and a happy and relaxed disposition that is the result of the actions taken being developed quickly and smoothly. Aquamarine clears confusion and will stimulate orderliness by bringing unfinished business to a conclusion. Aquamarine provides balance between the pituitary gland and the thyroid gland. In doing this, growth and hormone balance is regulated. It has been known to improve sight in cases of short or far sightedeness and helps to calm overreactions of the immune system, autoimmune diseases and allergies (particularly hay fever). Aquamarine has an affinity with Aquarius, Pisces, Taurus, Libra and Scorpio. It is traditionally the birthstone of March. It is a good stone for teachers, counselors, chiropractors, lecturers and massage practitioners. Aquamarine has a Receptive Energy, its Planet is the Moon and its Element is Water. In ancient and medival times, Aquamarine, like other blue stones, was believed to exercise a general tonic influence. It was supposed to counteract the wiles of the spirits and darkness and procure the aid and favor of the spirits of light and wisdom. It was also sometimes looked upon as an emblem of chastity. Some old legends tell how it could change color to reveal true or false and friend or foe. This blue-green stone has been carried by many a sailor to guard against storms and danger at sea. Because of its soothing influence, at one point, eyeglasses were once made from Aquamarines.